There’s no shame in being a nerd these days. If you like Star Wars, that’s cool. If you’re into yoga, that’s cool, too. If you’re into Star Wars and yoga, and have been wishing you could somehow combine the two, then Matthew Latkiewicz is your man. Latkiewicz, a California-based writer and creator of Star Wars Yoga, thought it would be funny if someone pitched a series of Star Wars-themed yoga poses to George Lucas in order to expand the franchise’s merchandising possibilities. He created a series of positions that show how strikingly similar yoga actually is to the many creatures and machines of the Star Wars universe. Downward-Facing Wookie (see image above), for example, is a lot like Downward-Facing Dog, except the right arm is raised and the yogi attempts to recreate Chewbacca’s signature gargling roar. The Vader breathing technique emphasizes deep breathing, mimicking Darth Vader’s familiar helmeted rasping. You can see more of Matthew’s Star Wars-inspired yoga poses here. 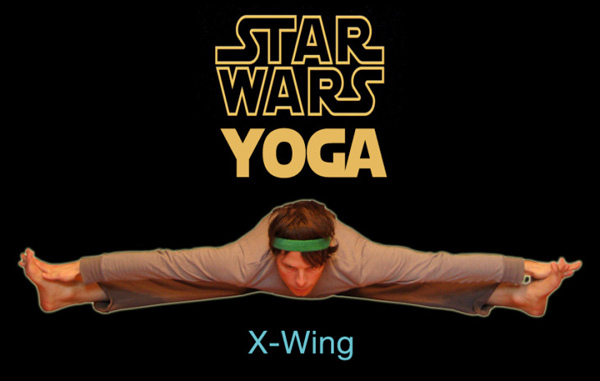 May the Force be with you...and your yoga.